As a headteacher I often say that when I make decisions about the school, I try to consider how I would have felt about that decision as a 10-year-old and how would I have felt about it as a young teacher. 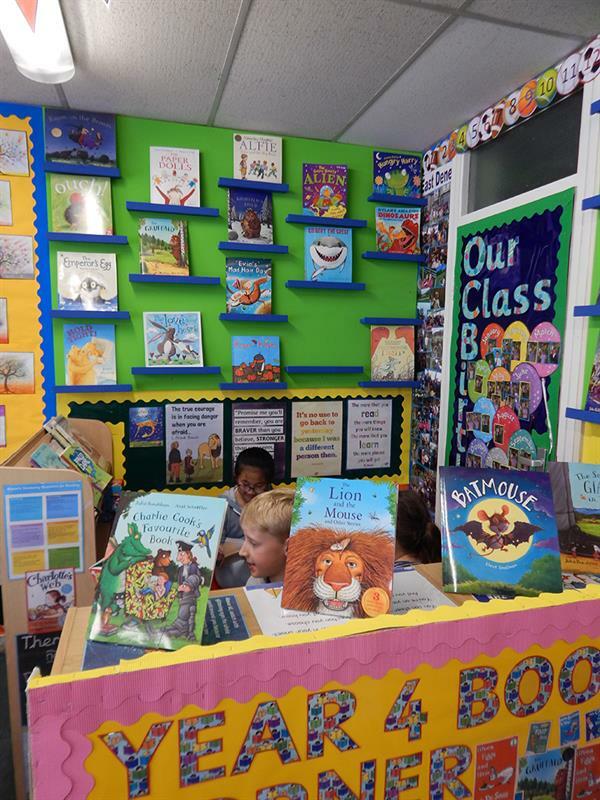 While I wasn’t a huge fan of school as a youngster, one thing I do remember with affection is the Book Corner we had in our classroom, in year 5. My teacher, Mrs Dowling, was someone I liked, looked up to and respected and looking back she helped turn me from a “reluctant reader” to a child who devoured books for fun. There is no doubt that the Book Corner that she had created played a significant part in that. We all liked nothing more than curling up in the comfort of the Book Corner with a book of our choice and we jealously guarded the time that each group was allocated to spend in this area. In recent years at Anton we have had a really significant and successful push on reading and this has resulted in a rise in standards. Our guided reading programme that involves every child in the school reading to an adult (in a group) for half an hour every morning from 9 to 9:30am is hugely popular with kids, teachers and parents. It was the first thing that Ofsted observed during our inspection and they loved it. Guided reading has definitely had an impact on reading attainment – last academic year children made, on average, 26 months’ progress in their reading age during the 10 months we were doing our reading programme. We are pleased with this, but it was actually the “love of reading” (as referred to by Ofsted) that we were determined to continue to develop. I visit schools that have superb library facilities and make great use of them. Sadly, our school library is very small and not really fit-for-purpose. In the years I have been at Anton we have tried any number of strategies to improve our provision but we haven’t got it right. Until now that is! It might seem contradictory when I tell you that the way we have improved our library provision is to decommission our school library. This was not a decision we took lightly, it was something we had considered for several years and the time had never felt right. We brought it up with governors and it got the exact reaction I had expected. One of our best governors is an excellent librarian in a superb secondary school just outside town so I had anticipated how she would feel. Clearly, and completely understandably, she was very anxious and while I outlined in detail our plan to deliver an attractive and well-equipped library in every single classroom, she was still very worried. I tried to reassure her, I gave her the evidence of all that we had done to promote reading over recent years and I asked her to trust me. Having got governors’ support (sort of!) the next step was for me to approach the people who could make this happen. I approached one of my recently qualified teachers to see whether she would be interested in taking a lead on this initiative to work with me to help achieve our aim of having a Book Corner in every classroom. Isolde is an excellent teacher, has a first class honours degree in English and is passionate about promoting reading, having worked closely with my outstanding English subject leader for the previous year. Happily, she was up for the challenge, so we decided to use her classroom as our guinea pig to excite the rest of the teachers and to secure support from some other key players. Isolde and I worked together to work out exactly what her library area was going to look like – we spent a Saturday afternoon shifting furniture about in order to create the best space possible without taking up too much of her classroom. I know that Isolde then spent a lot of time researching – I seem to remember that Pinterest got a lot of use and she often showed me photographs of ideas she had seen there. She decided on the best furniture for the area and of course critically which books she was going to purchase – again a lot of research was needed here. She was proud to tell me that even with bench seating, bean bags, cushions etc, the full extent of items on her wish-list had come in under the original £600 budget I had given her. At Anton we have a superb caretaker and as he is a highly skilled chippy; we benefit hugely from this. He built large wooden wall panels, made to measure for the classroom and then fixed them to the walls. This enabled us to display books really easily (see image, below). Once my caretaker had worked his magic, Isolde used a day of the school holidays to come in and put all her finishing touches to her Book Corner and when I came in to see it, I was absolutely blown away. We had an INSET after the holidays and the first item on the agenda was for us all to go down to 3L and for Isolde to talk to us about what she had done. Our staff team is a very supportive one and no doubt they would have made encouraging noises anyway, but like me they were quite genuinely blown away by what Isolde had produced. Their only query and anxiety was about who was going to get a Book Corner next and when they would get theirs! We have been working on this project since January and now have five class Book Corners complete, with three to go. There are definitely similarities between them but teachers have also had the flexibility to shape them to suit their classroom and to reflect their year group. Year 6 are currently being done and they have chosen to make their areas into Anderson Shelters, so as we speak my caretaker is helping them with this and yesterday after school there were seven members of staff painting camouflage markings onto the wooden wall units that Ray had made for them. Undoubtedly one of the most significant factors in the success of this initiative was to have recruited Isolde as an advocate; she was genuinely keen to make the project work. Once the first class library was complete I approached the PTA to see whether they would be happy to provide the finances to roll out this initiative across the rest of the school. At the PTA meeting I took them all down to 3L and Isolde talked to them about it and spoke about how the kids had reacted to it and the impact she believed it had already had on their enthusiasm for reading. Having seen it and heard about it, they were unanimously happy to fund the other seven classes – we asked for £600 per class and have pretty much managed to keep within this. In tandem with our project we have also renewed strong relationships with the library in our town. Fortunately this is only about a mile from school and it is a safe walk, so every half-term teachers walk their class down to the town library and spend an hour there. We have arranged to have mini inputs from the librarians and then the children have the opportunity to browse and choose a book. In the short time we have been doing this our pupils’ membership of Andover Library has more than tripled so that now the vast majority of our children are members (and we will not rest until we have 100 per cent membership).